After his 21 points against the Grizzlies, he finds himself only 9 points behind the Legend for 2nd place on the Celtics all-time leading scorers. 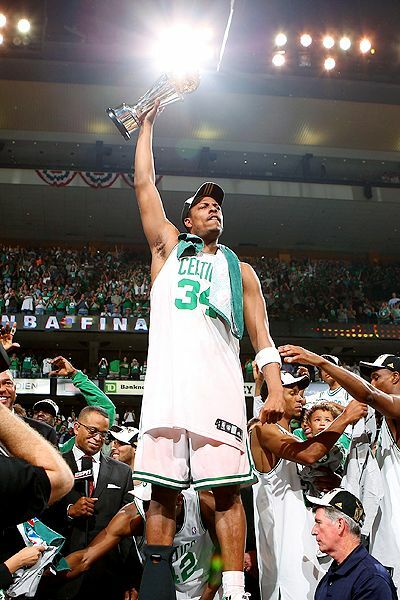 Pierce has been a Celt his entire career, through the dreaded 18 game losing streak of 2006 and leading the Celts to the 2008 championship. It’s only fitting that he’ll hopefully pass the Legend at the Garden on Tuesday before the Boston faithful. In honor of Paul, here’s his top five moments with the Celtics. And that was the beginning of The Truth. Paul’s life was in danger after he was stabbed 11 times September 25, 2000 in a nightclub. His life was saved by his then teammate Tony Battie. Luckily, paul was wearing a heavy leather jacket. This stopped the knife from hitting any key internal organs. Not only did the Truth start the first game of the season on October 31st, he played in all 82 games that year and led the team in scoring with 25.3 points per game. After getting ripped to shreds by Antoine Walker before the fourth quarter, which in itself is hilarious. Paul comes out and scores 19 of his 28 points in the fourth quarter and led the Celts to victory over the Nets after being down 26 at one point in the second half and 21 to start the fourth quarter. Pierce was dominant, getting to rim at will on a young Richard Jefferson. This was the biggest comeback in NBA history in the playoffs. This whole fourth quarter comeback is on YouTube and is almost a must watch for any diehard Celtics fan. Hands down one of my favorite games of all time. Game 7 of the Eastern Conference finals and it was Paul Pierce and Lebron James just going at it. Bucket after bucket the game went back and forth. Pierce ended up finishing up with 41 points and Lebron ended the game with 45 and the big L. Most underrated part of the game was the big shot that PJ Brown had at the end of the game to put the Celtics up by three. People forget how much Brown provided at the end of the year with the clutch shooting and the great post defense. He would be huge on the team this year. In the first game of the series Paul was injured and had to be carried off the court and wheelchaired into the locker room. I remember thinking that we were done. There was no way we could stay with the Lakers if Paul was out. A few minutes later to a roaring crowd, The Truth comes back and hits two straight threes to regain the lead and help take game 1 of the series. Paul was named NBA Finals MVP after they won the series 4-2. He averaged 21.8 points, 6.3 assists, and 4.5 rebounds. He also played great defense on Kobe throughout the series and kept him under control. This entry was posted in Celtics and tagged Bobcats, boston sports blog, celtics, Kobe Bryant, Larry Bird, lebron James, New Jersey Nets, paul pierce, Shaq, Shaquille O'Neal, The Truth by leibo4. Bookmark the permalink.